Home / Index category / Vive Tauron Kielce sign Filip Ivić? Vive Tauron Kielce sign Filip Ivić? The Polish best team, Vive Tauron Kielce, will get reinforcement between the posts for the upcoming years. 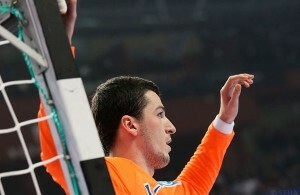 His name is Filip Ivić, the member of Croatian champions PPD Zagreb, finds out Handball-Planet.com. The 24 years-old goalie with nickname “Karate Kid” because of his physical skills, made a four years deal with the third team of Europe in last season. Ivić is part of the Croatian national team since World Championship 2013, but he hasn’t played at EHF EURO 2016 in Poland due lack of form caused by injury. Vive Tauron Kielce have Slawomir Szmal and Marin Šego between the posts since summer 2014. ← Previous Story Women’s EHF CL: Budućnost beat Gyor in biggest EURO derby!